If you’re unfamiliar with Tumblr, it’s kind of hard to explain without comparisons to other social media. Think blogging – but short, punchy, informal, and immediate. Think Pinterest, but in a scrolling feed style. Think Twitter, without the limitations of 140 characters. And think of hashtags like you’ve never thought of them before. The Tumblr interface has been around for seven years now, but when I jumped on the bandwagon about five years ago, it was still relatively small. I didn’t know anyone from “actual real life” who used Tumblr, and I’d stumbled onto it quite randomly. While Tumblr has grown steadily in that time, in the last couple of years in particular it seems to have gained momentum and reached a point of mainstream recognition. I was watching a sitcom the other day and someone threw out a Tumblr reference. I had coffee with a new friend recently and finally worked up the nerve to say, “Are you on Tumblr?” A few years ago I would never have dared to do this. I’d be far too certain that the answer would be, “I – I have no idea what that is.” Tumblr is now too familiar to ignore. At its barest definition, Tumblr is a microblogging platform. But I like to think of it as a form of digitised scrapbooking. Not the Creative Memories-style scrapbooking which is about events and moments, but the Victorian-era tradition of collecting ephemera, quotes, thoughts, and ideas, and keeping them all together in a highly browsable collection. Just as a physical scrapbook can be themed or random, coordinated or haphazard, so too with a Tumblr account: it gives you the opportunity to share or curate what you like, when you like. Heading to Tumblr.com will take you to a sign-in page with a signup button at the bottom left. Signing up will require of you an email address, password, and username. Your username will become your URL, but don’t panic – this is changeable later on. You’ll then be taken to a confirmation page to check your age and also that you’re not a robot, and then you’re done. 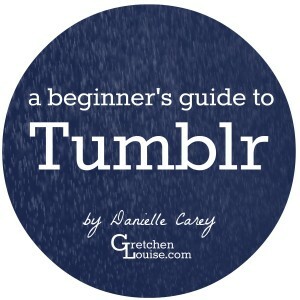 Tumblr will push you to find some blogs to follow – three, to be precise – which you can do by typing a Tumblr username into the search box or adding a few of the suggested blogs (you can get started by following Tumblr usernames danielle-carey, gretlouise, kindredgrace, adornabelle, and tshoxenreider if you like). Then you’ll be tasked with creating your own blog. You can tweak pretty much any aspect of this account so don’t stress if you’re not quite certain what you want to title it or what you think your avatar should be. That can all be arranged (or rearranged) later. You’ll be prompted to sign up for a link to the Tumblr app, but I skipped that since I’m already using the app (and yes, it’s handy). You’ll notice at the top of the logged-in home page (which is also your Tumblr feed) that Tumblr provides six distinct posting options. I personally think this is one of Tumblr’s coolest features; the interface makes it incredibly easy to share text posts, photos, quotes, links, chat conversations, audio, and video. I won’t create a break-down of what each post draft option looks like as it’s very self-explanatory and you’ll only need to play for a little bit to work out just how it all runs. I will, however, add that the photo sharing option includes ways for you to upload your photos and configure them in fancy schmancy layouts, but it can also work with your webcam to take a shot and upload it, or – happiest of happy time wasting devices – make a gif. You’ll have a lot of fun with that. Similarly, the audio-sharing option allows you to upload your own audio files (those not in breach of copyright, of course), or share through Spotify or via an external URL. The nature of what you want to share is up to you, as is the voice with which you communicate. Tumblr varies from traditional blogging formats in that the emphasis is not on a polished piece of writing or reserved, academic-style information-sharing (although of course both are welcomed). In fact, Tumblr rides the spectrum from late-night all caps rants to Serious Business content-sharing for esteemed sources like the New Yorker or the Paris Review, and that’s what makes it so much fun. A quick summary of my feed on any one day might be: someone flailing over a new film, a thoughtful book review, a pretty photo, happy fanart, flail, flail, historical rant, pretty, pretty, and then a heartfelt anecdote about someone’s dog having to be put to sleep. There is an immediacy to Tumblr posts which adds to the fast-paced sense of movement. Content is constantly being shared and yes, Tumblr can totally become a vortex of sleep-deprivation and bleary eyes if you don’t monitor your time spent there. Tumblr provides a unique way for users to interact with one another’s posts. At its most basic level, you can ‘like’ a post (by clicking on the little heart at the bottom right of the post). These likes get stored and you can access them any time you want by visiting the tab for liked posts in your feed sidebar. You can also reblog them, which you do by clicking on the swishy little double-arrowed thingummy next to the heart. This takes you to a reblog window which looks a lot like the ‘new post’ interface – except that the post content has already been filled by someone else. You can simply hit reblog and the post will now appear on your Tumblelog, with accreditation to the original poster. On Twitter, you can shoot someone an @reply. On Facebook, it’s likes or comments. On blogs, discussions continue in the comment sections. Comments are a part of Tumblr, but it’s perhaps the least useful aspect of the interface. Some Tumblr users allow commenting on their blogs; some are locked to allow comments only from those who have been following more than two weeks; and some don’t allow commenting at all. There is no simple way to reply to comments on Tumblr, which makes the discussion more difficult to follow. Many users opt to copy and paste the text from the comment into a new post and reply there. Tagging comes into its own on Tumblr. Tagging is a way to identify your content to others outside of just your followers, making your work discoverable (type ‘books’ into the search bar to see how tags work). Tags also provide a way for you to identify content that you’re interested in. You can track tags you’re interested in following so you don’t miss your favourite content. But do be aware that Tumblr usually drops from searches any tag phrasing past about the fifth tag on a single post, so if you’re creating content you want others to find, make sure you list the most important tags first. Unlike on Twitter and Instagram, hashtags on Tumblr are not restricted to letters and numbers without spaces. #so it’s entirely possible #to create hashtags #in a series #that read like this. For this reason, tags have morphed into their own kind of Tumblr vernacular far beyond being merely identification and search tools. Tumblr users sometimes create their entire commentary in hashtags or simply use them to express #SERIOUS AND OVERWHELMING EMOTIONS. Tumblr is kind of a big, happy, free-for-all. Those of you who were LiveJournallers back in the day will remember the sometimes delicate dance that accompanied adding someone to your friends list. Perhaps you just lurked for a while. Then there was a comment left on a public post. Then you added that person to your list and then – oh joyous acceptance – they added you back and you had access to their friends-only posts. On Tumblr, it’s a lot more simple. If you like what someone blogs or reblogs, you follow them. For the most part, Tumblr functions as a public space within its own little cosmos. I’m making a generalisation here, but usually it’s perceived as a compliment if you follow someone, even if there are no ‘degrees of separation’ already linking you to one another. Finding fodder for your mind and eyes is simple enough on Tumblr. But as a friend pointed out, making relational connections without the usual back-and-forwards of comment conversations can be difficult. You can forge connections instead by sending fanmail (the little envelope at the top right of someone’s Tumblr account) or a note through the ‘ask’ box (found at yourusernamehere.Tumblr.com/ask). Fanmail remains in your inbox, but asks may be answered either privately or as a public post, widening the discussion. Note that the option to have an ‘ask’ page and the option to allow comments on your posts are both settings that must be turned on. Check out the little cog at the top of your dash to tweak these. This is the barest of introductions to the world of Tumblr, but it’s certainly plenty to get you started. In my opinion, Tumblr is an incredibly easy to use platform, simple to navigate and fun to explore. Once you’ve played for a while, you’ll know your way around and you can tweak your layout (choosing from the free or paid themes, or designing your own) and even add secondary tumblelogs to your account. Learn how to schedule posts, and install a Tumblr bookmarklet for simple sharing straight from your browser. You can also explore tools built especially for Tumblr users (like Missing E) which will help you maximise your use of Tumblr. Or perhaps you’ll be happy scrolling endlessly through the constantly-updating stream of pretty things, and that’s okay, too. Have fun! Danielle Carey is currently finishing up an MA in Writing. She lives in south east Queensland where she makes up stories, teaches English, history, and music, and writes brief biographical snippets about herself in third person present tense. Thank you so much for sharing your expertise, Danielle! I loved hearing your view of Tumblr–you’ve inspired me to get back to using my own Tumblog. Thank you.